lack of success had nothing to do with our lack of effort. It had been a front burner issue as we had spared virtually no expense. And yet we still did not get the results we wanted. at higher levels. If that wasn't the case, I don't think you'd be here today. I know there are some very -- other good sessions going on. And secondly, that budgets are tight and getting tighter. That's kind of our reality. Two lies. I hope they're lies. 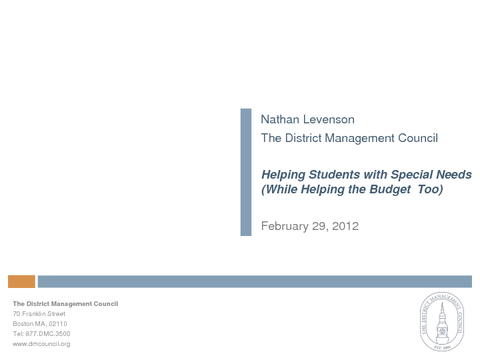 That more spending is needed if students with special needs are going to achieve at higher levels. I'll put it out there. special needs. I think these are lies and I hope they're lies because if they're true, there's not a lot of hope for a group of kids that we really care very deeply about. Some good news. well. Struggles with that -- with sounding out words, he doesn't like to read. He reads slowly, often doesn't catch the main points. I assume all of you have met and taught kids like Robert. they got extra help. And even as a principal, you got to feel pretty good, you know, even in a tight economy, you're providing extra help to a child who clearly needs something extra. laugh or frown, but definitely not hire a behaviorist tomorrow. If you said, okay, if you're not going to get us a behaviorist, at least get us another reading teacher and an extra math teacher. principals think this is a takeaway. No, this is success because our goal should have been to not need a paraprofessional for the rest of your life. But we're not always framing it that way. screwdriver and a reading teacher and all these other things that we'd rather have? And if -- you know, certainly we want to do this because it's good for Paula. That's first and foremost. with special needs and they've brought everybody in. You know, Nate's flying in for the day. He's got a bunch of people from his firm, so the superintendent's going to be there for the day. walk a little taller. You get to strut a little bit into the lunchroom, teachers' lunchroom. I have a friend who's a math teacher, she's been waiting 13 years to get to teach AP Calculus. questions that are only testing two concepts so that what you are really testing is student stamina, not student knowledge. Those are great skills that even great math teachers can lack. -- got double periods. Some districts make this double class pretty small, maybe 17 students instead of 25. Lots of places keep that class pretty small. All that has to sound expensive. to leave time for your questions. I'm hoping, and it's just a hope, that a lot of what I've talked about so far seems like common sense. It is not radical stuff, but it's not that common. times as many speech therapist as like communities, same-sized district, and the answer is almost always the same. Oh, we're really short-staffed. We would hire two more if we could. One of the great findings of our work is that each of you are approaching some of the same topics very, very differently. And we have not found a correlation in results based on the how manys. education. This is real data. This is from a really, really well-run district with a great director of special education who has her finger on the pulse of everything that is going on. because we really need to get pinpoint accurate on what you're going to put your energy. Making these changes is not easy. I wish I could give you a better, more encouraging answer to that. periods of math because I told you he didn't like going to math? What we have found is Matt didn't actually hate math. He hated failing math. He hated not understanding what was going on. getting them to learn, we have actually had, grab this, kids sneaking into the math class because they heard from their friends, you won't believe it, I get it for the first time in my life. skilled teacher. Obviously I cannot teach it the second time the same way I taught it the first time. That is so much like, you know, speaking louder to the person who doesn't understand English. tests. It is quite a step above Pennsylvania's. So this is a very high level of achievement. When we did focus groups with these students and asked them, how is it that you're doing so well? that should have happened years ago. So that's kind of how that the left hand option one would work. Option two works a little differently. The first period is a regular math class. early. I want to thank you very, very much for your time. Today, I hope you found this helpful. I'll be hanging around for a few minutes afterward if you'd like to ask any questions as well.